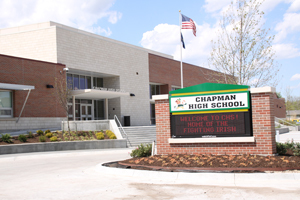 Chapman High School has been awarded the National Blue Ribbon. CHS is one of only three high schools in the state of Kansas to receive the award, and one of 286 schools in the nation to be recognized. Mr. Suther, Chapman High School principal, was one of only seven principals to be awarded the Terrel Bell award. Chapman High School has received the Governor’s Achievement Award and Standards of Excellence in Reading, Math and Science, meeting AYP requirements, and being the top 5% of High Schools. The Chapman FFA Chapter won the Triple Crown for Student Development, Chapter Development and Community Development. CHS was also awarded the National Blue Ribbon it is one of three high schools in the state of Kansas to receive the award and one of 286 schools in the nation. Mr. Suther was one of seven principals to be awarded the Terrel Bell Award. Received Governor’s Achievement Award Received Building Level Standards of Excellence in Reading, Math and Science, meeting AYP requirements, and being in the top 5% of High Schools. The Chapman FFA won the Top Honor for a Chapter in the State as a Triple Crown Recipient.